The Alaska Aurora Borealis, or northern lights, are glimmering ribbons of color that flash across the northern sky and leave all who see it with a sense of wonder and a feeling of being touched by some mystical force. Native Alaskans believed that the souls of departed ancestors could be seen in the shimmering colored bands of the northern lights. Turn-of-the-century prospectors held the belief that the heavenly display was a reflection of the ultimate gold strike “the Mother Lode”. The Alaska Aurora Borealis lights themselves are created by electrically charged particles, drawn to Earth’s atmosphere by the magnetic field of the North Pole. As the particles collide with the gases in Earth’s atmosphere, they become illuminated, creating the colorful aurora borealis. Although the magnetic field that creates the lights is active all year long, the long daylight hours of summer make the lights difficult to see. 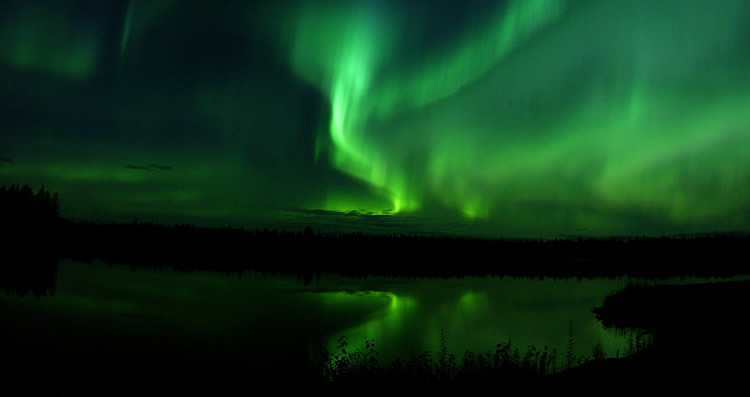 The best time to view this spectacle in Alaska is from August to April and the best Alaskan location for viewing is Barrow to the north and Fairbanks to the south of the Arctic circle. The northern lights have had a number of names through history. 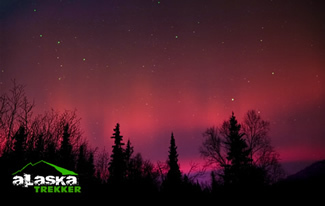 The scientific name for the phenomena is Aurora Borealis, which is Latin and translates into the red dawn of the north. It was the Italian scientist Galileo Galilei (1564-1642) who first used the expression. 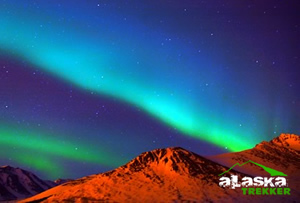 On the latitude where Galileo was living, northern lights consist of mainly red color. Digital photography is the way to go these days. Being able to see the picture on the back of the camera can easily tell you if you need more exposure time or less. You will need a camera that can stay open for 20 seconds or more and a tripod. Set the camera lens on a small aperture and use a cable release. Some cameras have a remote control. Use it if you have it. The less chance of any movement the better. The auroral activity forecast predicts the expected location of the most active auroral forms that can be expected for the given period. Aurora viewing is also affected by a variety of other factors, such as cloud cover, moonlight, and urban light pollution, so what you see will be strongly affected by your particular location and meteorological luck. The best time to observe aurora is near local midnight, when the most active forms often occur. More precisely, the time to shoot for is an hour or two prior to local geomagnetic midnight, and the forecast maps found here are calculated for that time. 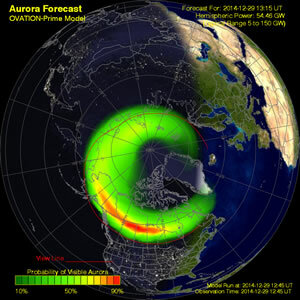 If you are a serious aurora watcher, plan to spend the night from about 9 P.M. to 3 A.M. watching for auroral action. Auroral activity tends to come in waves during an evening, which are called auroral substorms. Even during an active period, there will be lulls in which the auroral activity is subdued; however, the patient observer will often see a new burst of activity within an hour or two. The sky has to be dark which means the lights are hard to see in summer. (Saw them one night while fishing the Kenai River in June so it is possible.) The best months are March and September; that’s when there are: 1) frequent displays, 2) clear skies, and 3) generally mild weather. You’ll still freeze your tail off though! Start looking about an hour and a half after sunset. But peak auroral activity is between 10pm and 2am solar time. Solar time is 2.5 hours after clock time during daylight savings time (April through October) and 1.5 hours after during standard daylight time (November through March). That means the best time for seeing the aurora during winter is 11:30pm-3:30 am with the peak at 1:30am. During spring and fall (September and March), the best time is 12:30am-4:30am, with the peak falling at 2:30am. Anywhere north of the Mat-Su Valley is pretty decent but the Fairbanks area is the easiest place to see them on any given night. Hordes of Japanese tourists descend on Fairbanks over the winter just to see the Alaska Aurora Borealis. In Alaska, they can be seen as far south as Ketchikan. Bucket list cruise to see they northern lights. Me and.my brother disabled but would like the most economical cruise to see this one of seven wonders of the world. It’s very hard to see the Northern Lights in the summer here. The sun is up most of the time and the farther north it doesn’t set at all. You have to come here in winter to have the best chance to see them.